The Seattle Seahawks defeated the Green Bay Packers, 27-24, in Week 11 of the 2018 NFL season. Seattle did not start the game well on offense, with a Chris Carson fumble on the opening play, followed by a three-and-out on the next drive. They had four false start penalties on their first five drives but started to move the ball better to put up 17 points in the first half. 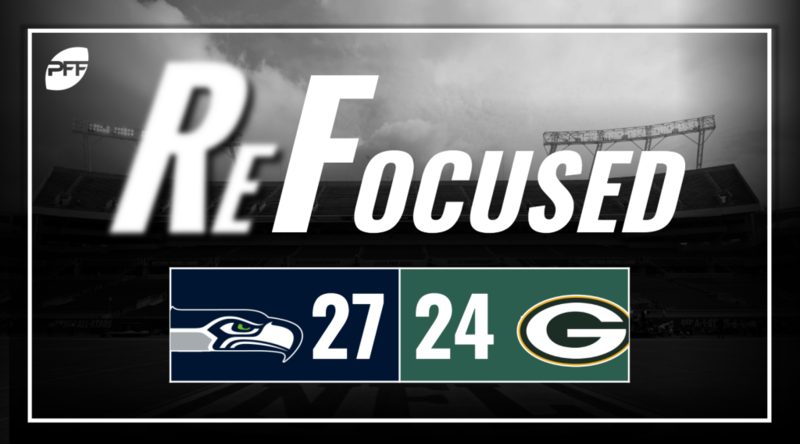 The second half started similarly to the first half, but they sustained a long drive to take the lead with an Ed Dickson touchdown and ran out the clock to keep Aaron Rodgers on the sideline. With five catches for 71 yards, Tyler Lockett stepped up huge when Seattle needed it most, with a third down conversion, followed by a nice catch on a deep crosser to get into the red zone that helped Dickson take the lead a few plays later. No surprise, Bobby Wagner was once again the best player on Seattle’s defense. The star linebacker made several stops around the line of scrimmage in the run game, gave up next to nothing in coverage and even managed to track Davante Adams 50 yards downfield and force an incompletion (even if he might’ve gotten away with some early contact). Seattle’s pass rush benefitted from Rodgers being forced to hang on to the ball longer than he’d like, but they were much better in the second half. It was a team effort, as they frequently went to stunts to get someone free and closed the pocket around Rodgers on several instances. The highs from Rodgers in this game were brilliant, none better than a ridiculous throw on the move to Robert Tonyan on his first touchdown of the game. As has been the norm, Green Bay’s offense went as Rodgers did. However, the Packers were also hurt by a few uncharacteristic third-down misses that sent their offense to the sideline. With the very obvious exception of Adams, who was great, the Packers receivers struggled to get open for much of this game. That forced Rodgers to hold on to the ball for lengthy stretches that allowed Seattle’s pass-rush to get home, particularly on some key third downs in the second half. Kyler Fackrell made his presence felt often. He had three sacks to increase his season total to eight and also had another hit on Russell Wilson to force a throwaway. He made a couple nice plays in run defense to make stops, as well. Kenny Clark was a force that Seattle had issues blocking in the run game for much of the night. Even though he only had two tackles on the night, he helped force runs away from the intended point of attack and funnel runners to his teammates. Unfortunately, others didn’t make the stops, and thanks to a few big runs, Seattle running backs still averaged over five yards per carry. Seattle really struggled to move the ball on offense at times, but they were able to put points on the board and sustain drives in the fourth quarter to secure the win. Rodgers did about as much as you could possibly ask, but receivers struggling to get open and some uncharacteristic misses on third downs late in the game paired with questionable late-game management was enough to keep the Packers from coming away with the road victory.